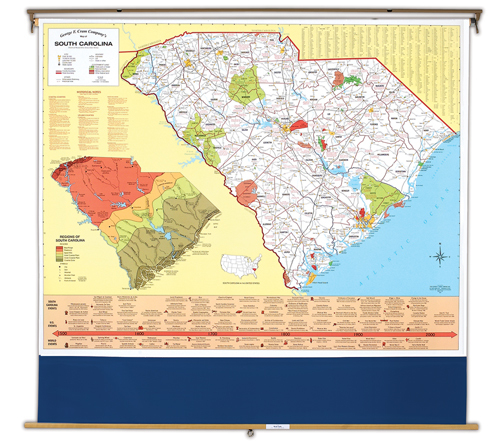 The South Carolina State Map is a comprehensive map showing a variety of political and historical information. The state map itself is divided into countries and has major roads and highways listed. An index shows the location of every town using a grid system. Smaller thematic maps show a variety of information about the state. A historical timeline is located at the bottom of the map. 64 inch x 50 inch . It is laminated, markable, and mounted on a heavy duty spring roller with backboard. This product was added to our catalog on Saturday 17 January, 2004.